Motors and transformers designed for use in the most demanding operating conditions are being applied on the Ras az Zawr sulphuric acid production plant. Outotec, a global leader in sulphuric acid plant design and delivery, has ordered a total of 21 MV motors, including slip ring types up to 5200kW, 24 WEG transformers, six liquid rheostat starters, and project management to install and commission the package. The equipment is being installed and commissioned in the World's largest sulphuric acid production facility, currently under construction at Ras Az Zawr, a mining and industrial city in the kingdom of Saudia Arabia. Ras az Zawr is a purpose built industrial city/zone on the Arabian/Persian Gulf coast in a region that is one of the richest natural and mineral resources areas in the world. One of the key activities within the Ras az Zawr zone is processing of phosphates for use in fertilisers. This involves phosphate concentrate being processed in a fertiliser production facility, consisting of a phosphoric acid plant, a sulphuric acid production facility, an ammonia plant, a DAP granulation plant and co-generation and desalination plants. Outotec was successful in winning the contact for the sulphuric acid (SA) segment of the project, the largest production facility of its type in one phase in the World. The total investment in the production facility, which includes three SA plants, is approximately $240M. When complete, the three plants will have a total production capacity of 13,500 tonnes of sulphuric acid per day. 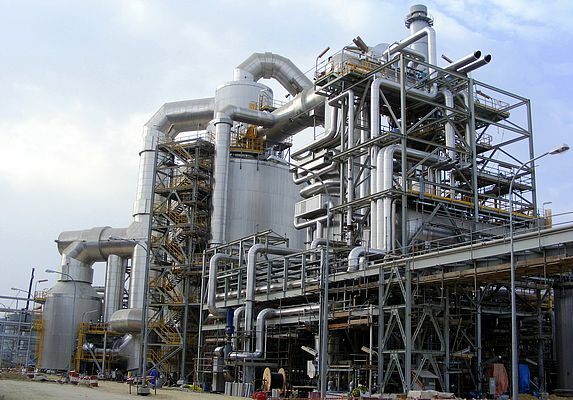 Due to the remoteness of Ras Az Zawr, and the possibilities for issues with multiple suppliers should problems occur, Outotec insisted on single suppliers for each element of the Sulphuric Acid project. The project started in 2006, and is only today nearing completion. 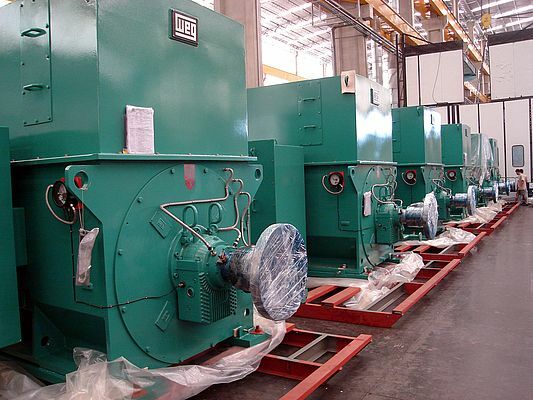 To-date WEG Germany has supplied 21 Medium Voltage motors: 6 x MAW710 5200kW 4p 13,8kV 60Hz, 6 xMGW450 1400kW 2ph 4,16kV 60Hz, and 9 x HGF400 620kW 6p 4,16kV 60Hz. These motors are used extensively in mining, marine and oil and gas applications; they provide the high levels of efficiency, reliability and long life demanded in the challenging conditions encountered in the Arabian Gulf. The MGWs and HGF type motors are used in the boiler feed water and circulation pumps of the sulphuric acid plant. The higher power (5,200kW) MAW units are slip ring motors that drive the main blowers in the plant. WEG decided to use slip ring motors controlled by liquid rheostat starters for this application as the blower inertia was large and starting current was an issue. The benefit of starting the main blowers in this way is that the customer can easily control the starting current of the blowers, at the same time handling the very high torques involved. In addition to the motors and starters, a total of 24 WEG transformers are used to supply and condition electricity to all types of equipment across the whole SA plant, including the WEG MV motors. In common with the MV motors the WEG transformers are designed for use in some of the most demanding operating conditions worldwide in hydro electric plants, desalination systems, oil and gas installations, mining, marine and many more. As evidence of this, WEG recently manufactured and supplied 200-ton transformers – the largest step-up power transformers ever made by the company - for the World's largest hydroelectric plant, Itaipu Binacional, on the Brazil/Paraguay border.